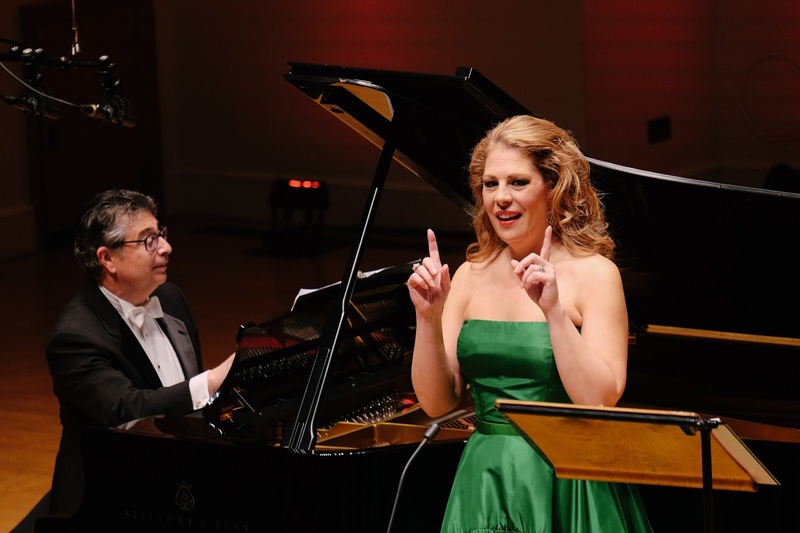 Amazingly, soprano Sondra Radvanovsky was making her London recital debut when she performed a recital at Cadogan Hall on Thursday 16 March 2017 with pianist Anthony Manoli as part of Rosenblatt Recitals season. Radvanovsky and Manoli's programme included 'Sposa son disprezzata' from Geminiano Giacomelli's La merope, three ariette by Vincenzo Bellini, a group of Richard Strauss songs, Allerseelen Op.10 no.8, Befreit Op.39 no. 4, Morgen Op.27 no.4, Heimliche Aufforderung Op.27 no.3, three of Franz Liszt's French songs, a selection of songs from Samuel Barber's Hermit Songs and 'La mamma morta' from Umberto Giordano's Andrea Chenier. 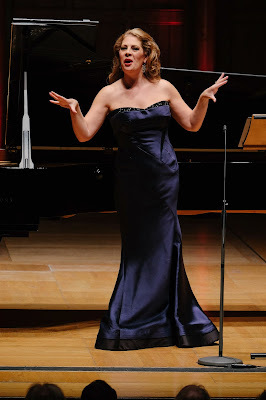 There was something slightly old school about Sondra Radvanovsky's recital in the way she started with arie antiche. 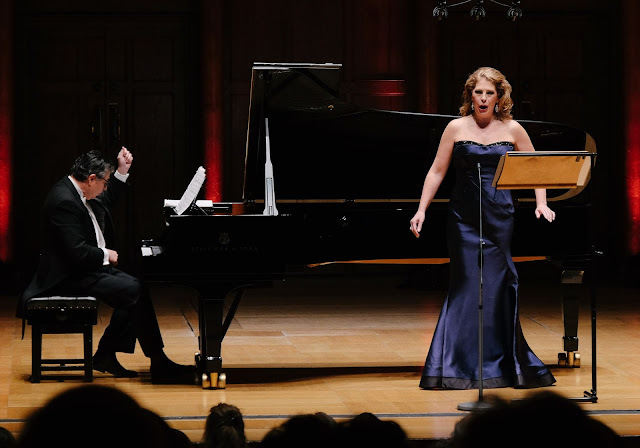 The programme was an interesting one which eschewed opera arias entirely until the last item, but it was only in the Giordano and the encores (three opera arias and a song from a musical) that Radvanovsky's voice seemed to come fully alive and fill the Cadogan Hall with vibrant life. Though their voices are very different, in many ways Radvanovsky's recital reminded me of the ones I heard Montserrat Caballe give at Covent Garden, with the careful trajectory from opening arie antiche to final encores when hair is finally let down. Alessandro Parisotti's arrangement of Geminiano Giacomelli's 'Sposa son disprezzata' was written in 1890, in an age long before period performance practice. The aria is from Giacomelli's opera La merope, but is best known for being included in Vivaldi's pasticcio La Bajazet. Radvanovsky sang it using a beautifully modulated middle voice only rising to full voice at climaxes, her expressive phrasing taking classic 19th century view of the music. Sony Radvanovsky has quite a large voice, her signature roles include the title role in Bellini's Norma and Leonora in Verdi's Il trovatora, roles which require a certain combination of volume and flexibility. Radvanovsky has this in spades, she regularly fined her voice right down and showed an impressive degree of control. This is combined with a rather particular, vibrant quality which means one's impression of the voice is of the highly distinctive and expressive phrasing rather than a pure sense of line. In Bellini's three ariette, from the group published in 1829, 'Per pieta, bell'ido mio', 'la ricordanza' and 'Ma rendi pur contento' Radvanovsky used her richly vibrant voice to highly expressive effect, creating deeply felt performances, but which at times she seemed to put too much expressive weight on the simple songs. There were, however, some lovely moments, finely turned phrases and some lovely floated top notes. An engaging speaker, Radvanovsky introduced each group of songs, highlighting the personal reasons for including them, and certainly no worries about combining singing and speaking for this diva. The Richard Strauss songs are a recent addition to Radvanovsky's repertoire, a new venture into German song which may tempt her into a new operatic repertoire. Radvanovsky's does not have a classic Richard Strauss voice, but Allerseelen fitted her voice well and was sung with highly creditable German supported by Anthony Manoli's strong piano. She put quite a range of colour into the voice, bringing out the emotions in the song. Befreit was beautifully controlled, rising to an intense, vibrant climax. Whilst Morgen was similarly finely controlled, I felt that the song did not quite float in the way it should and seemed anchored in Radvanovsky's middle voice. Heimliche Aufforderung was very vibrant, with a slow build leading to a terrific climax, again with a great sense of drama in the voice. Rather than lyric elegance of line, these were performances characterised by a luxuriant richness of timbre, a highly expressive flexibility of phrasing and a real sense of drama. Samuel Barber's Hermit Songs were written in 1953 for Leontine Price (cue a charming story about meeting Price backstage at the Met when Radvanovsky was still a young artist). The texts were originally written in medieval Gaelic or Latin and translated into English by a variety of people. The texts are anonymous, created by monks and scholars, often in the margins of manuscripts, short and straightforward observations and poems. A Saint Patrick's Purgatory was vibrant, with a strong piano accompaniment from Anthony Manoli, but Radvanovsky's performance seemed a little score bound and did not quite bring this strange little song alive. In Saint Ita's Vision she showed great sense of narrative, and gave a lovely floated ending to it. The Crucifiction was remarkably austere, not showy at all. The final two songs, The Mon and his Cat and The Desire for Hermitage were both performed with great charm bu could have done with a greater sense of the words. For the final item, 'La mamma morta' from Giordano's Andrea Chenier, Radvanovsky's voice seemed to finally move up gear. The role is new for her, she performs it at the Liceu in Barcelona next season. Her account of the aria was full of passion, with the voice rising to a thrilling climax though remaining wonderfully focused. The audience reaction was very warm and we were treated to four encores. The first, Rusalka's Song to the moon linked to Radvanovky's Czech heritage and you got a real feeling that the Czech words were important and meant something (rather than just being learned by rote). She sang this off copy and it really came alive. The same was true of the following three encores, 'I could have danced all night' from Lerner and Loewe's My Fair Lady, the Act One aria from Cilea's Adriana Lecouvreur and Tosca's 'Vissi d'arte'.